Instruct, inspire, and motivate with digital literacy resources that extend music concepts and understanding1. Explore the varied inspiration and purpose behind musicians' work. 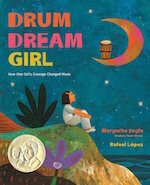 Hear the story of a child's courage and perseverance in Margarita Engle's Meet-the-Author Book Reading about Drum Dream Girl. Learn the backstory of famous musicians, genres, and approaches. 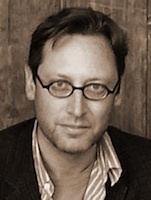 Bring the music-making process to life with Christopher Myers' Meet-the-Author Book Reading for Jazz. Discover ways authors and illustrators analyze, describe, and express music (genres). Listen and hear how the rhythm of Alexis DeVeaux's words mirror the rhythm of the music in the Meet-the-Author Book Reading for Don't Explain: A Song of Billie Holiday. Consider M.T. Anderson's blog post on his research for Symphony for the City of the Dead: Dmitri Shostakovich and the Siege of Leningrad describing the critical importance of music meeting military history.